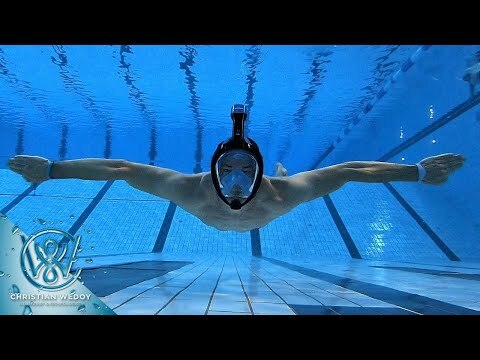 Snorkel mask enabling you to see and breathe underwater! The full-face snorkel mask, for breathing underwater as easily and naturally as you would on land with your nose and mouth. Thanks to its large size, this innovative mask also offers users an unobstructed 180 field of vision, and is prevented from fogging up by a double air-flow system that is identical to the system used in domestic extraction fans. To ensure that water does not enter via the snorkel, the mask is equipped with a mechanism that plugs the top of the snorkel when immersed in water. Furthermore, the top of the snorkel is highly visible in order to avoid any collisions on the surface. 1. WIDE FIELD OF VISION——180° field of vision and shatterproof polycarbonate window for added safety. 2. Easyly breathing——Full mask for natural breathing through the nose and/or mouth. 3. Anti-fogging——Exclusive breath ventilation concept prevents fogging. 4. Impermeability / seal——Dry Top snorkel system stops water entering through the top of the snorkel. 5. Water drainage——Purge valve at the bottom of the mask to drain water when the head is raised. 6. Easy dressing——Adjustable elasticated textile strap does not pull your hair out. 7. Visibility——Snorkel mask top can be seen from 4 times further away than a traditional Snorkel mask. 8. Swimming depth——Reminder: Surface mask, not suitable for free diving. 9. Size Inner diameter——approx > 4.7 inch (>12cm). Measure from the bridge of your nose to your chin. WIDE FIELD OF VISION——180° field of vision and shatterproof polycarbonate. Easy dressing——Adjustable elasticated textile strap does not pull your hair out. Visibility——Snorkel top can be seen from 4 times further away than a traditional. Anti-fogging——Exclusive breath ventilation concept prevents fogging. Impermeability / seal——Dry Top snorkel system stops water entering through the top of the snorkel.